Most people would agree that taking a daily multivitamin is a good idea it’s often referred to as an “insurance policy” for covering nutritional gaps left by a less than optimal diet. New Chapter believes a daily multi can be much more than a nutrient backstop. In fact, we believe our Organic, Whole-Food Multi’s can serve as the foundation of your complete nutrition program with multiple benefits in support of your overall health and wellness. Cultured, organic, and safe for pregnancy herbal blend combine whole foods and Class 1 herbs with live probiotics to support a healthy pregnancy. Once-per-meal formula is easy-to-take, easy-to-digest, and can be taken anytime even on an empty stomach! New Chapter Multi’s utilize only fermented soy to deliver these compelling benefits supported by each formula’s whole-food vitamins, minerals and herbs. All of New Chapter’s Multi-vitamins are probiotic and whole. The herbs and cultured whole-food vitamins & minerals in each formulation work together to promote optimal health and deliver condition-specific benefits – not just address nutrient deficiencies. * New Chapter’s formulation team takes exacting care with each nutrient in all of our targeted daily Multi-vitamins to benefit the specific needs of the individual. 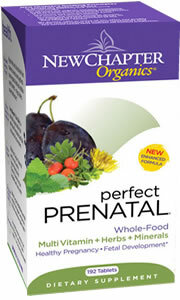 Perfect Prenatal whole-food multi-vitamin, including targeted levels of whole-food folate, is formulated specifically to nourish mother and baby. Cultured and safe for pregnancy herbal blend combines whole foods and Class 1 herbs with live probiotics to support a healthy pregnancy. New Chapter Multi-vitamins utilize only fermented soy to deliver these compelling benefits supported by each formula’s whole-food vitamins, minerals and herbs.